The Baku Grand Slam 2017 came to an explosive ending in Azerbaijan as the heavyweights went toe-to-toe on the third and final day in the World Championships 2018 host city. 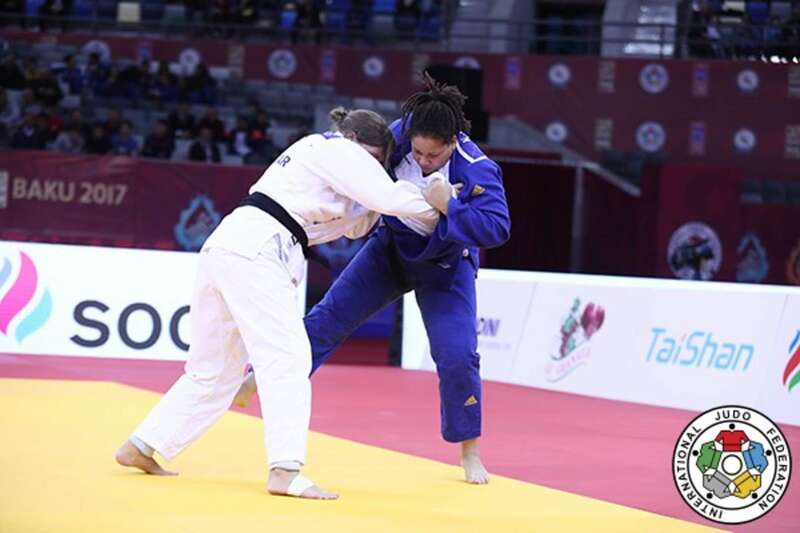 The second Grand Slam of 2017 featured five categories on the final day as the men’s -90kg, -100kg and +100kg categories were joined in action by the women’s -78kg and +78kg categories. Double Paralympic champion and Azerbaijan hero Ilham ZAKIYEV was among the distinguished guests in attendance along with Greek great Ilias ILIADIS who brought the curtain down on a glorious career when he retired in December. 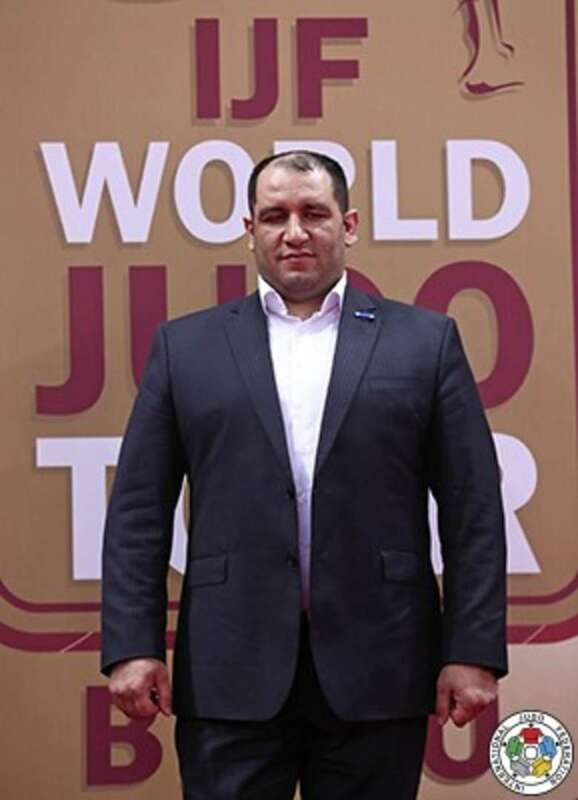 ZAKIYEV, 37, who is Vice President of the Azerbaijan Paralympic Committee, is preparing to compete at the Islamic Games in Baku this May and spoke of his pride at seeing the IJF World Judo Tour in his country. “I’m very happy to see the judo family in Baku for this fantastic IJF event. I am fortunate to have a great relationship with the IJF who have always encouraged me. I am very grateful for that and I have to thank the IJF President Mr. Marius VIZER for his friendship and support. 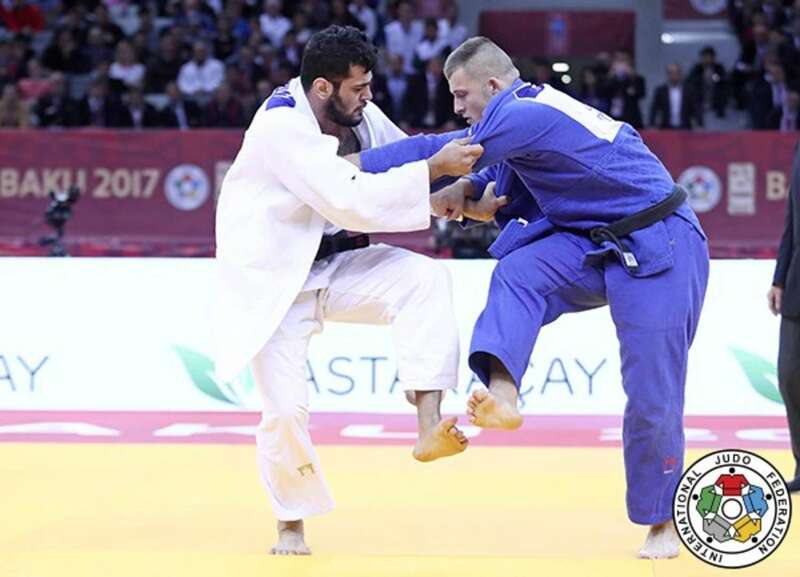 The visually impaired judoka is adored by the Azeri public and has aspirations to continue his competitive career through until the Tokyo 2020 Olympics. “I am very much looking forward to fighting at the Islamic Games at home and I have never won the competition so I am extremely motivated,” said the heavyweight star. The IJF World Judo Tour will remain in Europe as it now heads to Georgia for the Tbilisi Grand Prix from Friday 31 March to Sunday 2 April. 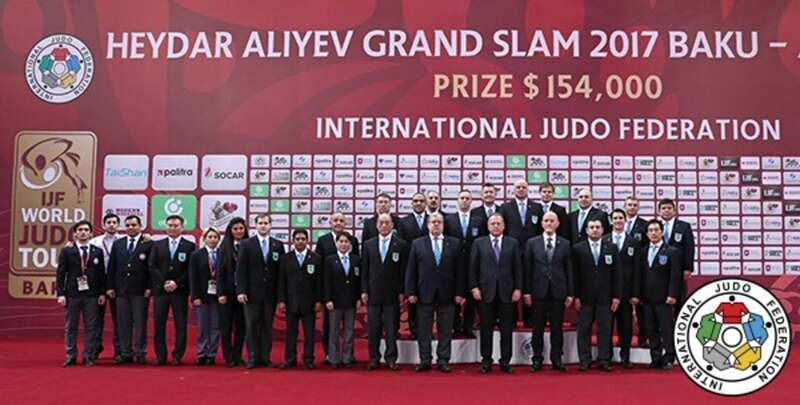 Following the Paris Grand Slam, Dusseldorf Grand Prix and the Baku Grand Slam, the second Grand Prix of the year will take place in Georgia’s capital city and judo hotbed of Tbilisi where 297 judoka and 37 nations will compete. Rio 2016 Olympic stars will be among the judoka in Georgia chasing Grand Prix glory as Olympic champion Tina TRSTENJAK (SLO), Olympic silver medallist Odette GIUFFRIDA (ITA) and Olympic bronze medallist Dirk VAN TICHELT (BEL) will all feature. World Judo Masters bronze medallist Guusje STEENHUIS (NED) showed that she is the present and future for the Netherlands at -78kg as she tamed Rio 2016 pick Marhinde VERKERK (NED). Former world champion VERKERK, 31, who lost in her first contest at the Olympics in Brazil, was thrown with a osoto-makikomi for a waza-ari and was then held down for 20 seconds. The silver for VERKERK should be enough to earn future selections while STEENHUIS did exactly what she set out to achieve and is arguably her country’s top medal hope for the World Championships in Budapest. In the first semi-final STEENHUIS bested 23-year-old YOSHIMURA Shiori (JPN) on shidos in golden score. After a scoreless four minutes of regulation time and one shido going against the Japanese the contest continued into golden score until YOSHIMURA received a second shido which sent STEENHUIS into the final. In the second semi-final two-time Grand Slam winner JOO Abigel (HUN) fell to VERKERK by a waza-ari from a neat ashi-waza attack. JOO, who was penalised with a shido for a leg grab, committed too much and could not stop the all-Dutch final from being realised. The first bronze medal was won by JOO who is well on her way to being a major contender at the World Championships in Budapest. JOO defeated Tashkent Grand Prix silver medallist Albina AMANGELDIYEVA (KAZ) by ippon from an ouchi-gari having led by a waza-ari as the Kazakh was outmatched. The second bronze medal contest was won by YOSHIMURA who marked her first IJF start since 2013 by defeating Abu Dhabi Grand Slam bronze medallist Samanta SOARES (BRA) by ippon after two minutes. 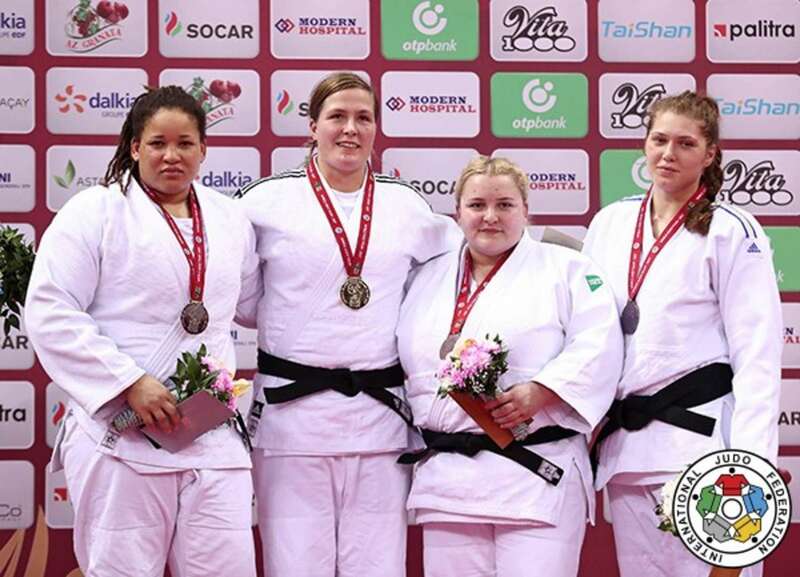 Former Paris Grand Slam bronze medallist Tessie SAVELKOULS (NED) came to the fore in the women’s heavyweight category as she conquered the Baku Grand Slam. SAVELKOULS, who finished seventh at the Rio 2016 Olympics, defeated European champion Kayra SAYIT (TUR) in the +78kg final with a waza-ari from a drop seoi-nage giving the Dutchwoman control and the outsider held her rival in osaekomi until the Turkish judoka tapped out. In the first semi-final Dusseldorf Grand Prix bronze medallist Larisa CERIC (BIH) was disqualified after receiving a third shido to send SAVELKOULS into the gold medal contest. In the second semi-final SAYIT downed u23 European Championships bronze medallist Yelyzaveta KALANINA (UKR) by a waza-ari after a plucky display from the young Ukrainian. The first bronze medal was won by Tokyo 2020 hope KALANINA who beat Abu Dhabi Grand Slam bronze medallist Santa PAKENYTE (LTU). KALANINA is the Ukraine’s top project as the Federation have invested in the former basketball player and now that is starting to be repaid after attaining a first Grand Slam medal. PAKENYTE was thrown with an uchi-mata in golden score for a waza-ari as the tallest judoka in the category showed that she is more than a work in progress after a fifth-place finish at the Paris Grand Slam. The second bronze medal was won by Svitlana IAROMKA (UKR) as Ukraine won both +78kg bronze medals. CERIC was penalised a third time for passivity which was one more shido than IAROMKA accrued as the latter ensured that two Ukrainian flags would be raised during the women’s heavyweight awarding ceremony. Former Asian Championships bronze medallist Islam BOZBAYEV (KAZ) won his first Grand Slam title at the expense of Almaty Grand Prix bronze medallist Mammadali MEHDIYEV (AZE). World number 93 faced his third Azerbaijan opponent of the day in the final and the result was the same on each occasion. With 43 seconds left the Kazakh judoka scored a waza-ari with a morote-seoi-nage and went back to the same technique 20 seconds later for a second waza-ari to finish as a comfortable winner. In the first semi-final MEHDIYEV beat colleague Abdulhagg RASULLU (AZE) by a waza-ari in a typically closely contested meeting between two teammates. In the second semi-final BOZBAYEV defeated Rome European Open silver medallist Tural SAFGULIYEV (AZE) with a morote-seoi-nage earning ippon after 68 seconds of golden score. BOZBAYEV scored first with a waza-ari before SAFGULIYEV drew level with a waza-ari from a sumi-gaeshi. The Kazakh seized the initiative in added time and won with his trademark technique to deny the home judoka. 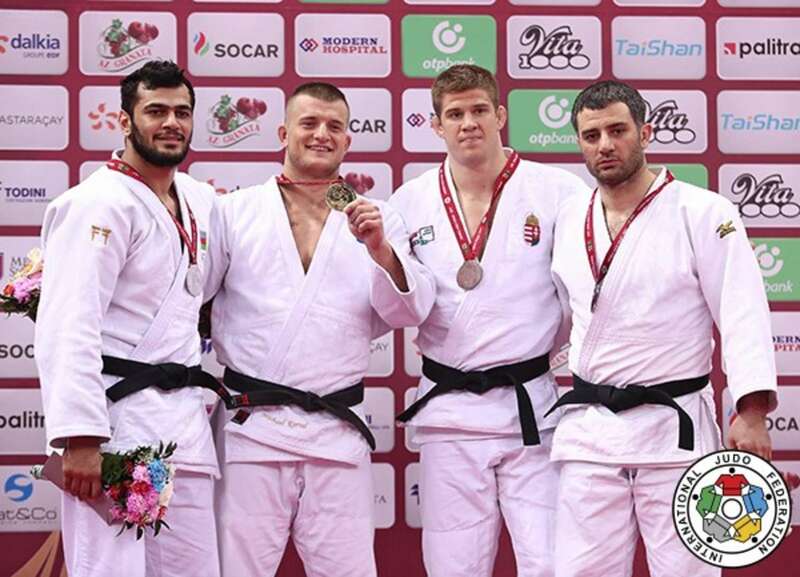 The first bronze medal was awarded to Odivelas European Open silver medallist Quedjau NHABALI (UKR) who drove world number 189 RASULLU over for ippon with 15 seconds left on the clock with an osoto-gari. The opening contest of the final block produced a first career Grand Slam medal for the Ukrainian who is enjoying his best spell on the international circuit. 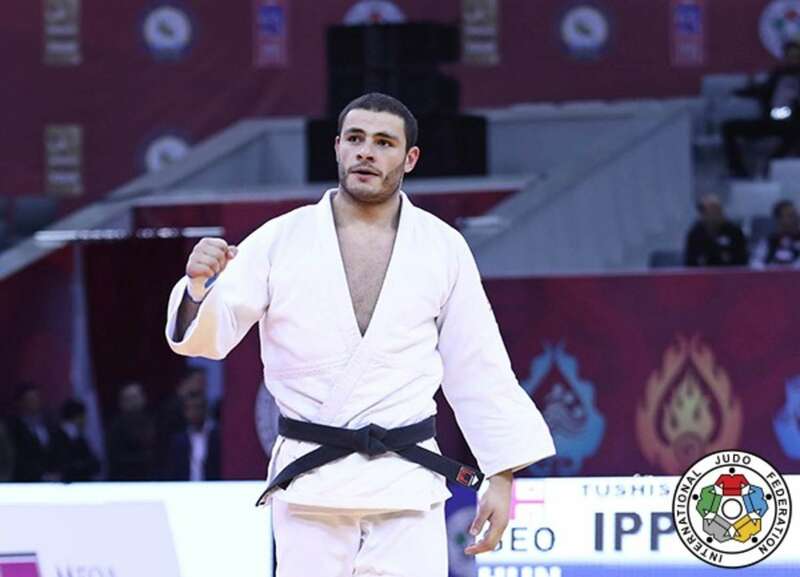 The second bronze medal went to two-time Baku Grand Slam silver medallist Ushangi MARGIANI (GEO) who defeated SAFGULIYEV to win his first international medal at -90kg having jumped up from -81kg a year ago. MARGIANI anticipated the ura-nage attempt which put the Azeri off balance and the Georgian used both hands to control the upper body of his rival and send him over for ippon. Dusseldorf Grand Prix bronze medallist Michael KORREL (NED) is on a roll in 2017 having matured into being a consistent international performer for the Netherlands. KORREL, 23, controlled the contest against Rio 2016 Olympic silver medallist Elmar GASIMOV (AZE) but golden score was still required to separate the two. GASIMOV could barely stand up and KORREL was sucking on air as the former was penalised for passivity after four minutes of added time. In the first semi-final GASIMOV bested former world champion Elkhan MAMMADOV (AZE) in an all-Azeri clash. While the crowd and the judoka would have rathered that the teammates had met in the final they had to go head-to-head to decide who would represent Azerbaijan in the final. With four seconds left and no scores registered the veteran MAMMADOV was reprimanded for the third and final time to lose out and move into the bronze medal contest. In the second semi-final KORREL saw off Baku Grand Slam 2016 silver medallist CIRJENICS Miklos (HUN) by a waza-ari to seal a place in the final. The first bronze medal was won by CIRJENICS who prevailed against Rome European bronze medallist Peter PALTCHIK (ISR) by ippon at the halfway point. 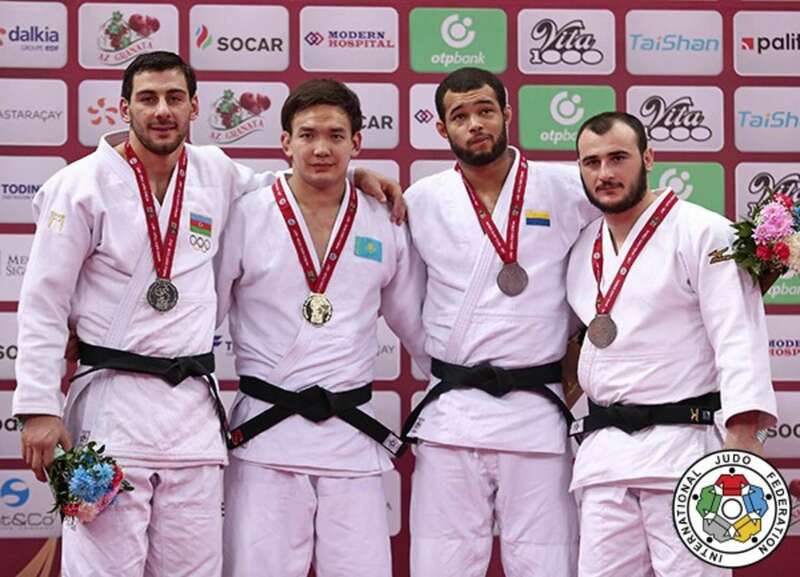 The second bronze medal was won by 35-year-old MAMMADOV against Ulaanbaatar Grand Prix winner Zelym KOTSOIEV (AZE). The 18-year-old was given a third shido to hand the win to his countryman. 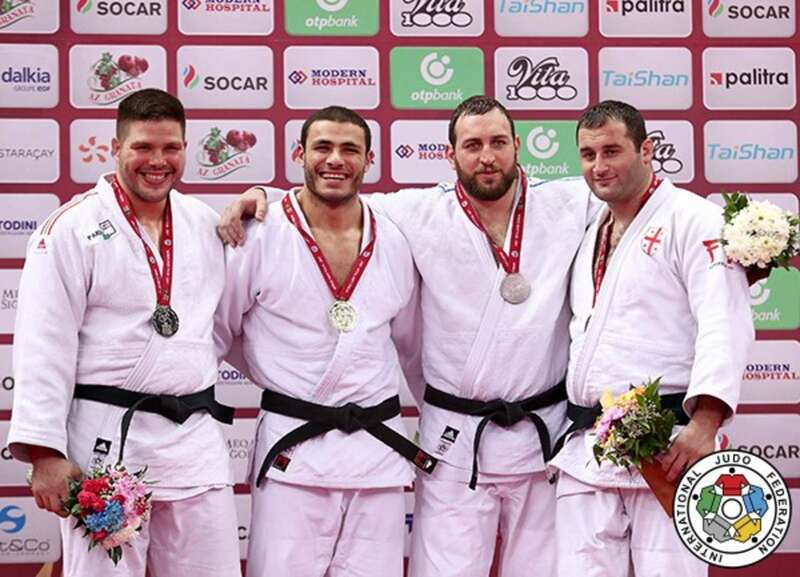 Junior European champion Guram TUSHISHVILI (GEO) made light work of a high calibre heavyweight field as he collected his first IJF World Judo Tour medal in sensational fashion. The 22-year-old, who weighed in at 107kg, opposed Dusseldorf Grand Prix bronze medallist BOR Barna (HUN) in the final and made it four wins by ippon from four contests. The Georgian, who defeated the top seed and double Olympic bronze medallist Rafael SILVA (BRA) in the quarter-final by ippon, has moved up to heavyweight as Rio 2016 Olympic silver medallist Varlam LIPARTELIANI (GEO) has vacated the -90kg category to compete at -100kg. Fearless TUSHISHVILI scored a waza-ari from a drop seoi-nage and then dispatched the Hungarian with an osoto-gari for the maximum score. In the first semi-final former TUSHISHVILI bested Ushangi KOKAURI (AZE) after 66 seconds by ippon from a drop seoi-nage. In the second semi-final BOR troubled Zagreb Grand Prix bronze medallist Stanislav BONDARENKO (UKR) to such an extent that the Ukrainian was penalised three times to receive hansoku-make. The first bronze medal was won by BONDARENKO as former Junior World champion ULZIIBAYAR Duurenbayar (MGL) was inactive for the majority of the contest and received three shidos to be disqualified. Paris Grand Slam bronze medallist ULZIIBAYAR, 23, toiled as he struggles to maintain his consistency on the IJF World Judo Tour while BONDARENKO was marginally more active. 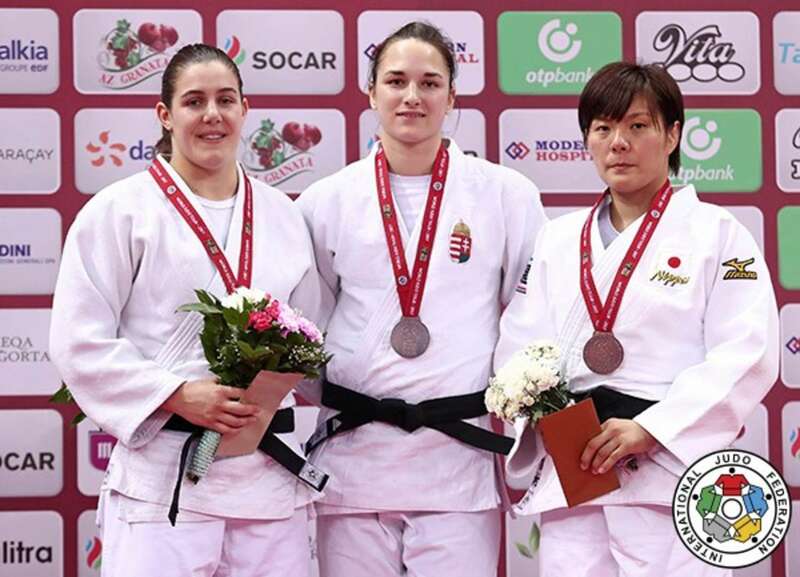 The second bronze medal went to Odivelas European Open silver medallist Onise BUGHADZE (GEO) who pipped KOKAURI to the podium by a waza-ari score.